A new method of real-time GNSS user positioning availability control for transportation applications is considered. The positioning availability value is defined as a full probability of event when we get a personal GNSS user’s required navigation parameters (RNP) taking in account the current Positioning Delusion of Precision (PDOP), ranging errors and positioning errors. On a basis of GNSS/LAAS network dataset we get current GNSS performance statistics, such as positioning error standard mean and standard deviation and a number of positioning failures within the observation period. The PDOP values are used in order to compute an alarm index of a probable sudden positioning deterioration under poor GNSS satellite vehicles (SV) geometry. The method can be recommended for some transportation applications which have strong RNP. Especially, the method can be recommended for transportation applications such as aviation landing systems and automatic railroad traffic control. The present study deals with the development of a method involving physical experiment and numerical simulation. The aim is to predict the possibility of maximal use of the plastic resource of a low-carbon steel circular blank subjected to deep drawing. The material hardening curve under uniaxial tension was found experimentally. A series of real physical experiments of deep drawing were carried out. FEM-simulation of the experimentally observed material mechanical behaviour was performed. The variation of the parameters of the stress-strain state in selected areas of the blank volume is shown accounting for the advance of the blank shape transformation. The reported results could be used to assess of the residual plastic resource of quality steel products, and to investigate and predict the deformation process development in such material. Thus, stability loss during blank form-change or plastic strain localization could be prevented. 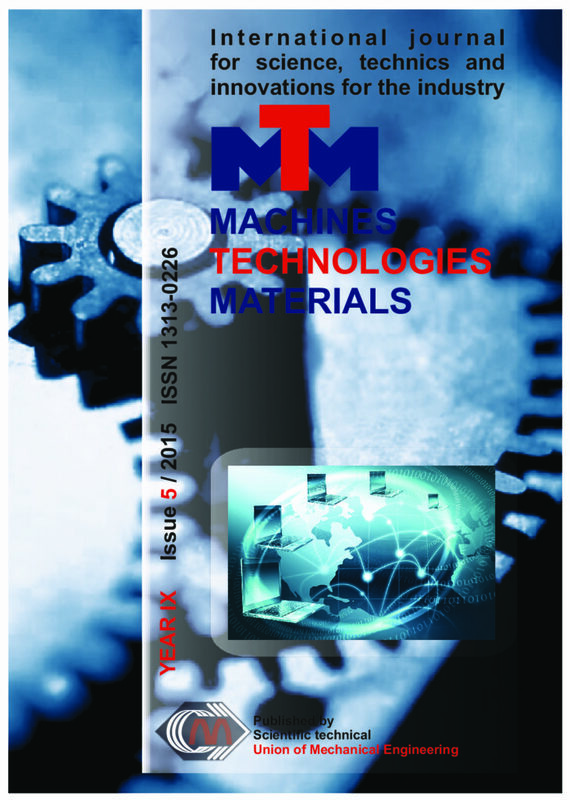 The paper provides a comprehensive description of theoretical and practical aspects of electronic speckle pattern interferometry for technological residual stress measurement in various machine elements. Any results obtained by investigation of residual stress in a welded joint are presented. A method for measuring contact pressures based on the measurement of irreversible changes in a surface microrelief by the speckle photography technique is presented. The analytic dependence between the change in the contrast of the carrying Young’s fringes and the relative area of change in the microrelief is considered. An example of a contact interaction between a cylinder end and a flat slab, the latter with a specially produced regular roughness on its contact surface, is used to experimentally verify the relation between the irreversible change in the roughness, the change in the contrast of the holographic interference fringes, and the change in the contrast of the carrying Young’s fringes. It is shown that the sensitivity of correlation speckle photography is higher than the sensitivity of the correlation holographic interferometry technique. Analyzing subject of this report is the trademark as a individualizing element, image mark and intangible asset for any organization. The author of the publication proves that the management of the trademark is a key aspect in the overall management of modern organizations regardless of the fact that currently it is not a focus of managers. The report suggests separation of an independent functional strategy of trademark management, named as “Strategy of commercial signage”. This strategy creates new opportunities and avoid the clichés of strategies like "red ocean". In this paper we propose a method of solving inverse stability problem for some classes of non-linear dynamical systems with a small uncertain parameter. The method is based on T. Kato’s perturbation theory of linear operators. We illustrate our method by solving inverse stability problem in the situation of monomerization reaction inside the cascade of chemical reactors. In this article is proposed a new approach to the classification of the technical state of aircraft gas turbine engines in the course of their life cycle. Given classification takes into account the occurrence of new kinds of technical conditions of the engine, which arises during the operation of aircraft equipment upon technical state. For faulty operating condition and for efficient operating condition is introduced the concept of critical and non-critical state. The article shows how is changing in the process of operation functionality of the engine, provided in the form of a curve with a characteristic areas and breakpoint for operation of the engine. This introduced breakpoint for operation of engine corresponds to its state before the failure state. There were introduced, on the basis of changes in the degree of functionality of the engine, certain technical conditions into which aircraft engines can enter and stay. The introduction of technical The article presents diagram of possible transitions from one condition of the engine are described mathematically on theoretic-plural level. The article presents diagram of possible transitions from one engine technical state to another affected by both the operational and external control factors. Economic activity "collection, disposal and treatment of waste water" is especially risky in terms of working conditions. A significant proportion of workers in this activity are regularly exposed to humidity and low temperatures. Particularly significant and causing serious damage to the health of employees impact of materials that can cause infectious diseases. Additional physical and psychological stress has and the fact that employees must comply with stringent quality standards. In order to facilitate the risk assessment process, the European Agency for Safety and Health at Work – Bilbao (EU-OSHA) has developed a comprehensive user-friendly free web application, OiRA (an interactive risk assessment online tool), which helps micro and small enterprises to perform an overall step-by-step risk assessment – from identifying and assessing risks at work, making and implementing decisions on preventive measures, to continuous monitoring and reporting. The main issues are considered in this topic is the impact of pneumovortex effect on the free ball located inside the cylindrical thin-walled elements. Researches were carried out with various diameters of deforming balls and lengths of cylindrical parts. Obtained results show high precision of roughness inside walls of cylindrical tubes. The article deals with a fundamentally new methodology for optimization, assessment, and control of the roughness of surfaces that can be applied in all production facilities. What is meant by optimization is the choice of the most appropriate roughness from among all the practically possible values that can be achieved in certain production conditions. The given methodology is used as a basis for the assessment of the influence of surface roughness on the strength of a joint formed through the process of hot pressing. Surface activity of water solutions, surfactants, has been calculated on the base of concentration dependence of surface tension. Compounds for deactivation, based on synthetic detergents in different concentration scales have been offered. The error of aviation bombs mission use is sum of aiming error and technical scattering error. Technical scattering full error is sum of partial errors. Technical scattering full error of aviation bomb for ejection release is determined. Human resource management is an important element of the strategy and policy of any organization. Application of systems for automated execution of activities related to the management and remuneration of human resources gives competitive advantages of organizations. The article identified the main systems and forms of software applications for managing human resources in Bulgaria and analysis of their essential functions. Presented are the features and benefits of cloud technologies in process automation in human resources management and the risks and disadvantages inherent in their use. The recommendations on the use of cloud technologies and software solutions for managing and rewarding of staff in the organization.